Colliers International have been advising developers to focus on more affordable condominium product. Over the first two quarters of 2017, the Yangon condominium market had witnessed a slight uptick in demand following extensive pricing promotions for many projects. While this has buoyed overall sales take-up, Colliers sees the performance as temporary, and the strategy as financially unsustainable. Colliers advise developers to look long term instead. Future projects should generally address concerns over affordability. This should altogether be reinforced with key drivers such as access to financing tools i.e. bank financing with reasonable terms; improvements in the currently onerous car parking regulation; and the enforcement of the long-overdue condominium law. Extensive pricing promotions temporarily stirred demand. However, Colliers expect overall sales at least in the next two years to remain modest. Colliers expect the total completed stock to exceed more than 7,000 units in 2017. Colliers estimate that this number will more than double in the next two to three years. However, construction delays remain an issue. The introduction of competitively priced condominiums should drive higher sales in the medium to long term Selling Prices Existing pre-selling developments are likely to maintain prices. Colleirs expect newer developments to introduce rates at competitive levels. Following the completion of Swae Daw City Towers A & B, Yangon’s condominium stock totalled more than 6,600 units as of Q3 2017. The new supply for the 2017 year was expected to reach around 1,200 units, a similar level to 2015. However, construction delays amid the lacklustre sales performance could drive the rate of completions to slow down at least within the next two years. 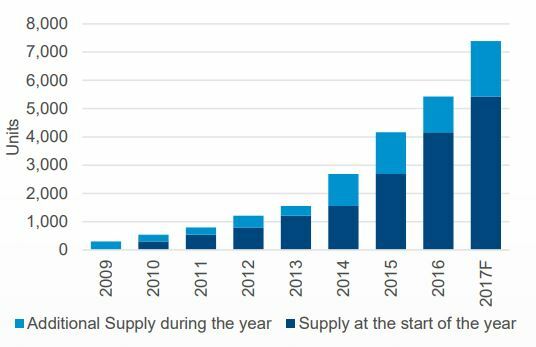 Still, the future supply remains substantial with more than 10,000 units currently in the pipeline. The number of project launches is likewise on a declining trend. The units launched have significantly dropped starting in 2016 with 1,600 – roughly half the figures recorded in each of 2014 and 2015. This year, the number continues to decrease sharply with only 860 unitslaunched as of Q3 2017. Overall developers’ confidence remains dampened, owing to a generally weak sales performance, with many opting to shelve future projects as they reassess possibly more effective strategies. In addition, the majority continue to adopt a “wait and see approach” while seeking further clarity to the impending condominium law. Some of the highlighted stipulations in the current draft law include the 25% maximum stake in foreign ownership as well as protective measures for both local and foreign buyers. In light of the frequent construction delays and some project cancellations, Colliers sees that these protective measures are rather crucial in reinforcing buyers’ confidence to which will perhaps facilitate sales in the future. Above all else, Colliers sees that affordability remains a main concern given the general market’s modest income along with the lack of financing tools, among others. While Colliers have also observed capable buyers and investors for upscale projects, the inventory is considerably outpacing demand. In fact, these buyers are now becoming cautious with their selection process, adopting a more conservative approach than in the past. Click here to download the Colliers Quarterly Review - Yangon Condominium Report Q3 2017. For more information on the Colliers Yangon Condominium Report or to discuss the Yangon property market phone or email Karlo Pobre from Colliers International Myanmar via the contact details below.